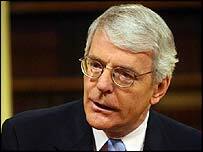 John Major: "No justification for blaming pilot error"
John Major has called for the pilots of the helicopter which crashed on the Mull of Kintyre 10 years ago to be officially cleared of blame. RAF investigations concluded that Jonathan Tapper and Richard Cook had been guilty of gross negligence. But Mr Major, who was prime minister at the time of the crash, said the evidence did not support this finding. The Ministry of Defence has rejected his call, saying that there was nothing to undermine the original findings. Writing in the Times newspaper, he said the 10th anniversary would be the right time to overturn the verdict and described how the horror of the incident had never left him. 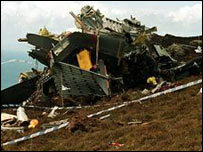 The 29 people who died on the flight from Belfast to Inverness included Northern Ireland's top experts on terrorism. At the time, Air Chief Marshall Sir William Wratten noted that it was "the largest peacetime tragedy the RAF had suffered". The RAF immediately convened a board of inquiry. Mr Major wrote: "Under the existing rules of such inquiries, negligence by the crew piloting the helicopter could be found only 'in cases where there is absolutely no doubt whatsoever'. "We may never know what truly caused this tragedy. It follows, therefore, that there is no justification for blaming pilot error. "Soon the 10th anniversary of this crash will be upon us: it is time to set aside the original verdict and bring comfort to the memory of the pilots and remove the burden that has lain too long upon their reputations and their families' peace of mind. "We owe justice to the dead. I am not persuaded that they have had it." The initial inquiry decided that the most probable cause of the accident was an inappropriate rate of climb over the Mull of Kintyre but no evidence existed that either pilot, both of who died in the crash, was negligent. However, at the final part of the board of inquiry process, two senior RAF officers decided that both pilots had been grossly negligent. Their conclusion has always been challenged by the pilots' families. The House of Commons Public Accounts Committee subsequently looked at the evidence and found that the charge of negligence was unjustified. A more detailed inquiry by a select committee of the House of Lords found unanimously that the standard of proof necessary to sustain a verdict of gross negligence could not be justified. In response to Mr Major, the Ministry of Defence said in a statement: "The findings of the Board of Inquiry have been extensively examined. "No new evidence has come to light that warrants re-opening or overturning of the original findings. "The government retains every confidence in the judgement of the reviewing officers who were convinced that they had met the required standard. "In nearly 10 years since this tragic accident, the MoD has examined all the complex technical, legal and airmanship issues raised by those opposed to the finding, but has found nothing to undermine it."